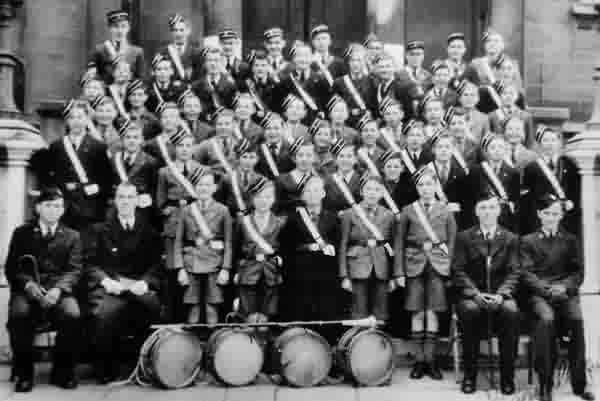 The Boys' Brigade was founded in Glasgow on 4 October 1883 by William Alexander Smith (knighted in 1909) in order to combine military-style drill and fun activities with Christian values. It is an interdenominational Christian youth organisation. Within the next few years the movement quickly spread across the United Kingdom and many Companies were founded, including one at Yeovil founded by 1892. As reported in the Western Gazette, in 1892 the Baptist Boys Brigade had over 30 members under the command of 'Captain' Chaffey. 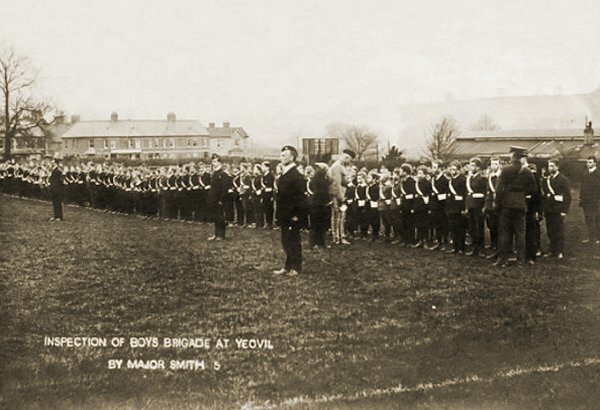 By 1905, when the Yeovil Boys' Brigade were inspected by the organisation's founder, Major William Smith, at Pen Mill Athletics Ground, the number of boys in the Yeovil Company was significant (see first photo below). 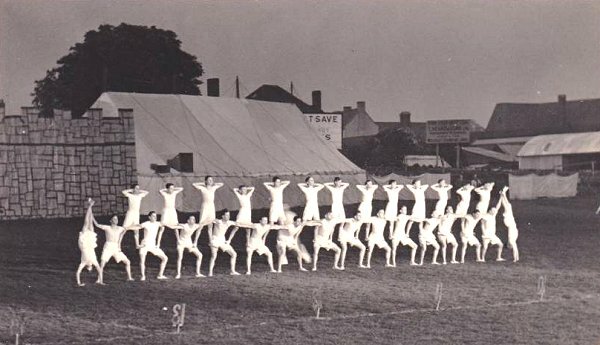 The Pen Mill Athletics Ground, next to the Pen Mill Hotel and Pen Mill Station, was the home of the Yeovil Casuals Football Club until their ground moved to Huish in the 1920s. 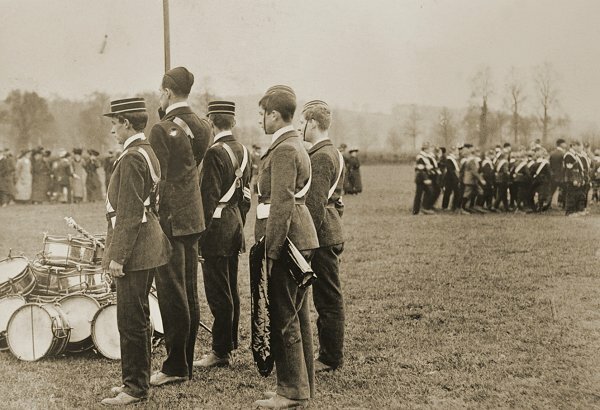 By 1910, there were about 2,200 Companies of Boys' Brigade connected with different churches throughout the United Kingdom, the British Empire and the United States, with 10,000 officers and 100,000 boys. The Newnam Memorial Hall and Schools in South Street were opened on 21 October 1912 and became home to the 1st Yeovil Company Boys' Brigade which still meets weekly at the South Street Baptist Church. The 3rd Yeovil Company meets at Preston Road Methodist church in Cedar Grove. A report in the 16 December 1892 edition of the Western Gazette with some interesting statistics. A report in the 21 May 1897 edition of the Western Gazette. 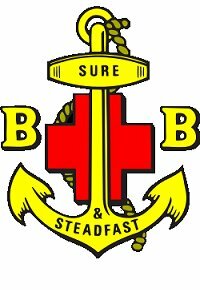 Note that at this time the Company was called the "Baptist (No 1) Boys' Brigade". 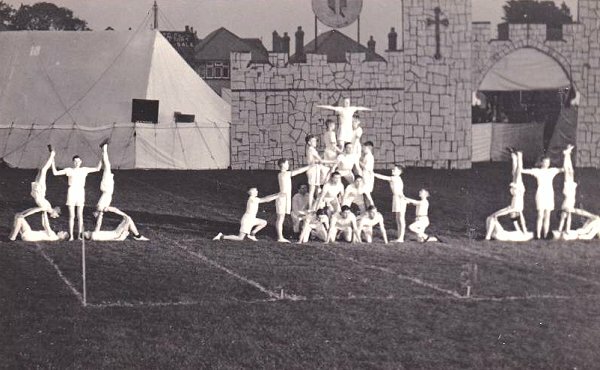 An inspection of Yeovil Boys' Brigade by the founder of the organisation, Major William Alexander Smith, at Pen Mill Athletics Ground in 1905 (see above). 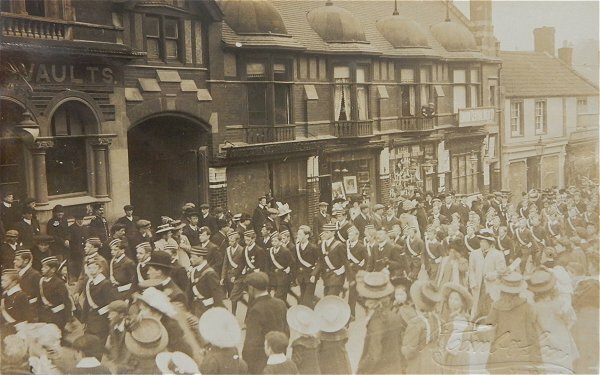 A photograph of the Yeovil Boy's Brigade parading along Middle Street, outside the Coronation Hotel and Vaults, around 1905. Possibly returning from the inspection seen in the image above. The photograph is by Witcomb & Son and their studio features at centre with examples of their work seen in the window. 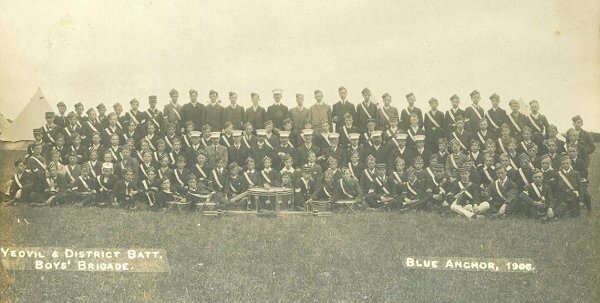 The Yeovil District Battalion, Boys' Brigade, in camp at Blue Anchor, Somerset, in 1906. 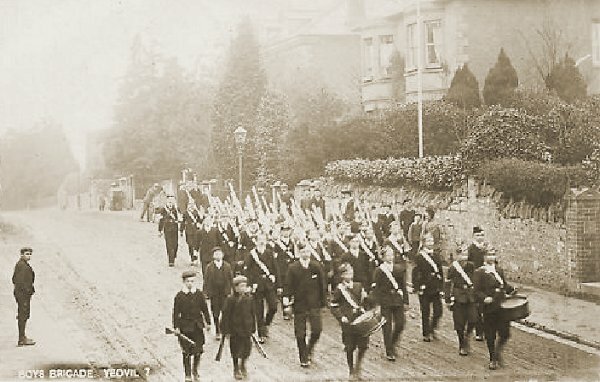 A photograph of around 1908 showing the Yeovil Boys Brigade marching along Sherborne Road. Look closely and you'll see that most of them are armed with rifles!!! 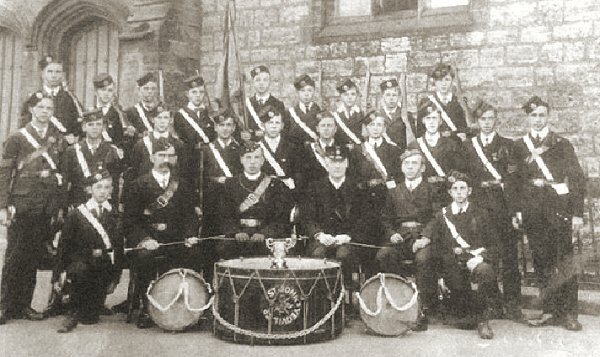 The Wessex Battalion of the Boys' Brigade at an inspection of 13 April 1909. Someone should have shown them how to stack drums properly. 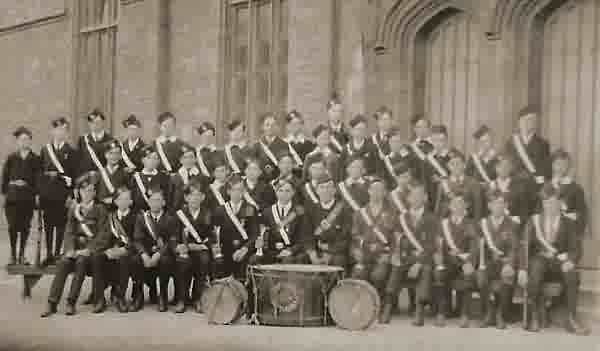 The St John's Boys' Brigade company, photographed around 1912 by Witcomb & Son. The same company, with a few more members - so I'm guessing a couple of years later. Tattoo by the Wessex Boys' Brigade at Yeovil Town football field. Photographed 1939. 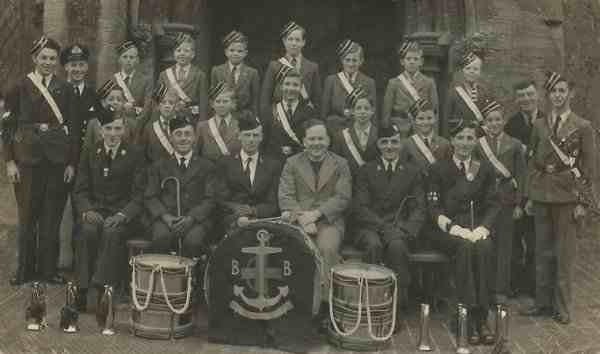 Members of the Boys' Brigade pose in front of St John's church, late 1930s or early 1940s. Members of the 1st Yeovil Company photographed on the steps in front of the Baptist Chapel in South Street around 1944. The only known person (at present) is Peter Wood (3rd row from the front, 2nd from right). Can you name anyone else? 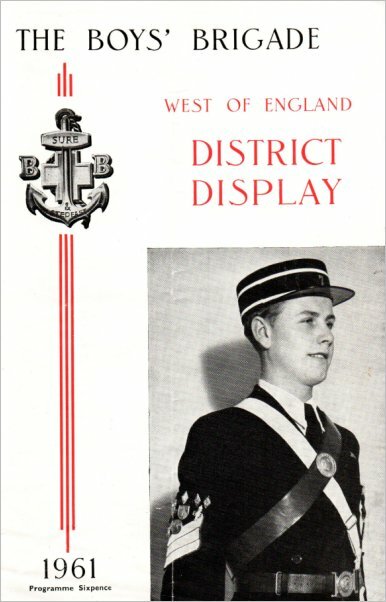 Cover of the souvenir programme of the 1961 West of England District Display held at the Town Hall, Torquay, Devon, in which the Yeovil Boy's Brigade took part. 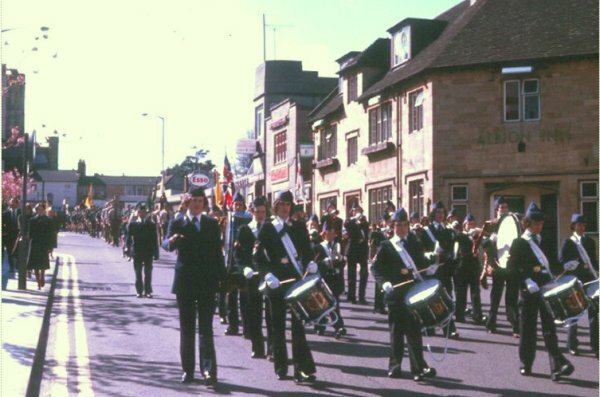 The Boy's Brigade marching along Vicarage Street during the mid-1970's. 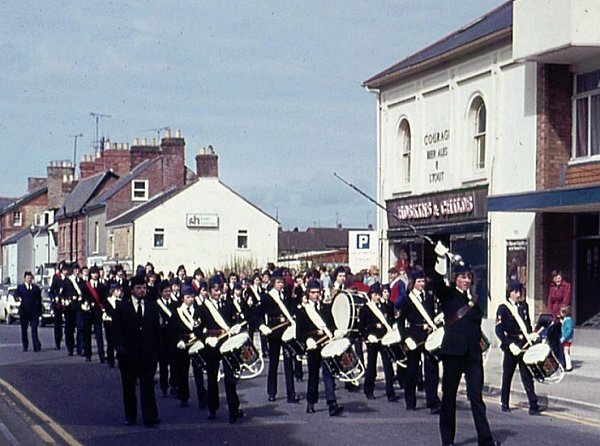 The Boys Brigade parade along Huish in the late 1970's and pass by Hoskins and Childs store which, according to the signage at first floor was still selling Courage beer, ales and stout. Where the parking sign is, used to be Queen Street and in the space between the car park sign and the next building (which still exists) was where, until shortly before this photo was taken, the Victoria Inn had stood. 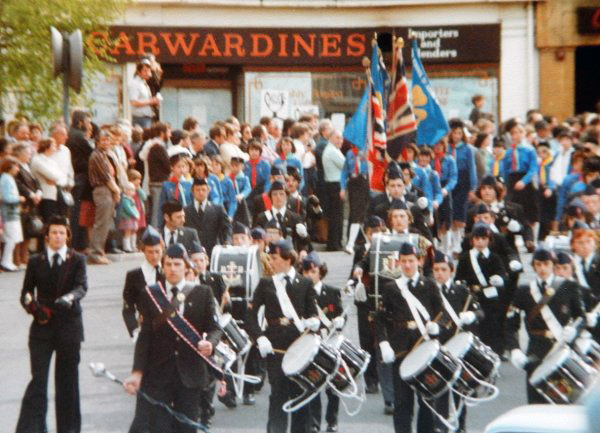 The Boys' Brigade band march through the Borough in 1983, passing the Carwardines, formerly the Cadena, building in the back ground. 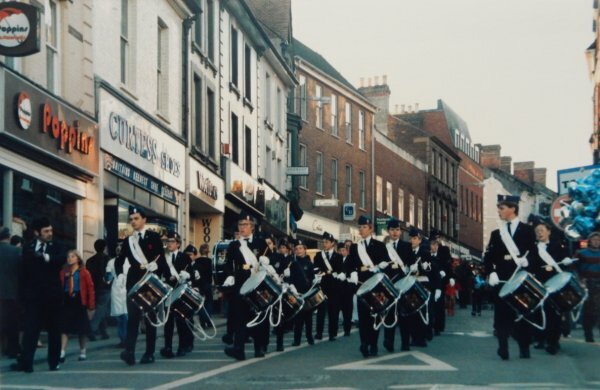 The Boys' Brigade band march down Middle Street, approaching the Triangle, around 1985.